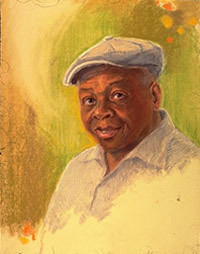 Douët's protraits are artistic renderings of people that reveal their personality characteristics and physical likeness. 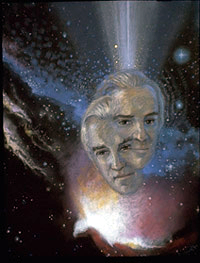 Sometimes certain souls desire and request that the Spiritual Essence of identity be revealed in images as the true Self beyond personality and form. These images are visual poems intended for empowerment. 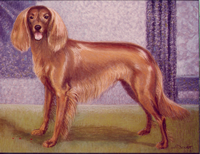 Douët can work with all ages and even domestic animals. 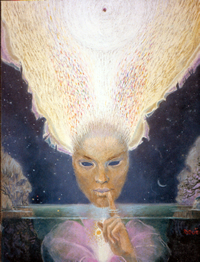 For more information and arranging a sitting for your Portrait or other private commissions, see "How To Buy"
The several aspects of bodies of a single human being are depicted here as she sits on a lotus floating on a flowing river. The river is a metaphor for life in motion. The lotus symbolizes the grounding of spiritual awareness. Go beyond the opposites in the outer world of illusion. 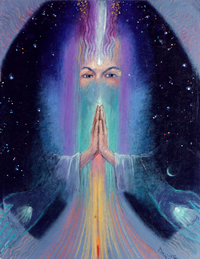 Go beyond the mask of personality and appearance, then enter the Ineffable Light of Soul. 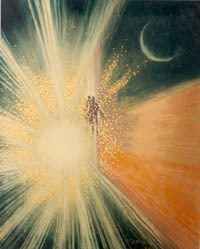 Go beyond the wall-papering of outer appearances into the Light of the Eternal Constant. Listen for the Sound of all sounds. If you silence the senses in the NOW, you will experience the opening of the heart flower. This lady had experienced much long lasting grief over the death of her baby. 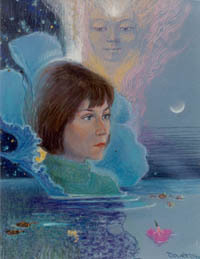 The blue flower signifies her opening of Soul awareness. The water features her feeling nature. The past is like a dead flower behind her and, in the present, a flower floats in front of her. 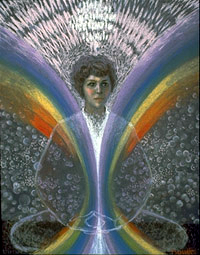 This is a Soul Portrait of a healer who had formally studied healing for years with Barbara Brennam. Only her eyes and hands were drawn from life. More emphasis is focused on spiritual Energy. 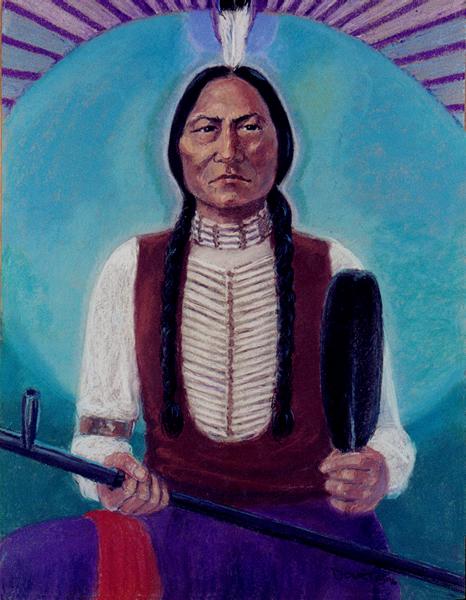 This portrait was derived from visual research made on a very old newspaper photograph of this great hero. This scientist probes the mysteries of the universe. 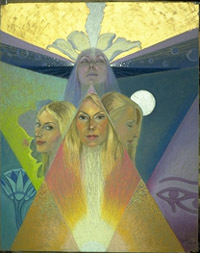 This rendering shows physical beauty with reference to the spiritual "Third Eye" chakra. 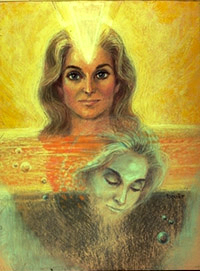 The astral body is hinted in the lower right and the emotional aspect is symbolized by the water. 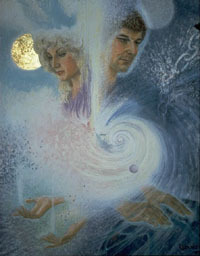 The mental is shown by the element of air. This depiction shows the different levels or bodies of a single human being. This woman experienced a physical healing when she visualized The Divine Light energising her whole body like a waterfall cascading into her form. 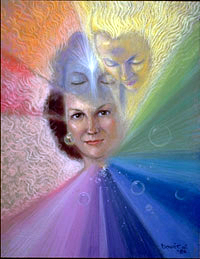 The second image signifies higher Self of the personality shown in the lower quadrant. 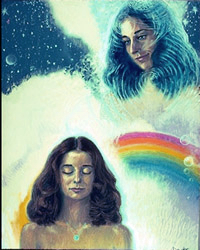 The rainbow is a symbol of spiritual awareness. 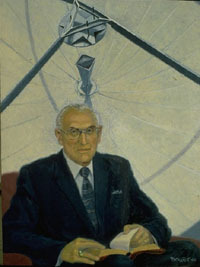 This multi-millionaire sold all his TV stations in the United States to consolidate the capital for the manifestation of a research foundation to promote health and healing modalities. An interior portrait can show symbols that signify inner male and female qualities or factors. 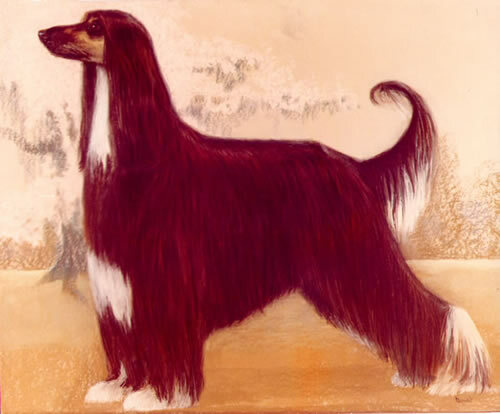 Colors are a metaphor for certain characteristics. 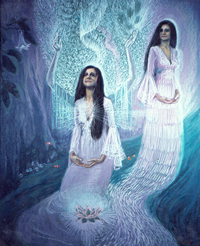 This portrait depicts two personalities working in their respective healing modalities along with angels who they asked for assistance in the work. 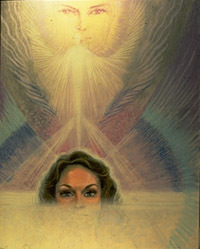 This is a symbolic rendition or portrait of a woman showing integration of her heavenly (sky) nature and that aspect of her which is of the Earth. 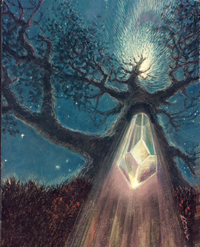 The crystal represents her divine potential to integrate the heavenly and sexual natures. Rise above the smog of the mental and emotional atmosphere of Earth and connect with your own angel. Thus you raise the frequency of your vibrations to Higher Being. 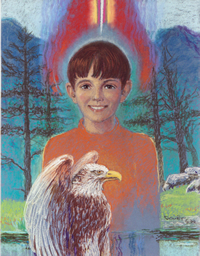 Young boy with red aura holding an eagle. 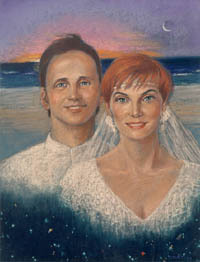 This is a multiple portrait of Dawn, the wife of the artist. 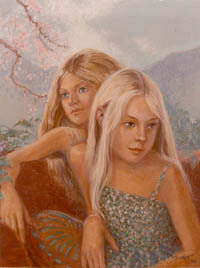 A portrait can show several aspects of a person beyond appearances! Ares was the winner of Best Award for 35 time and retired undefeated from the ring.